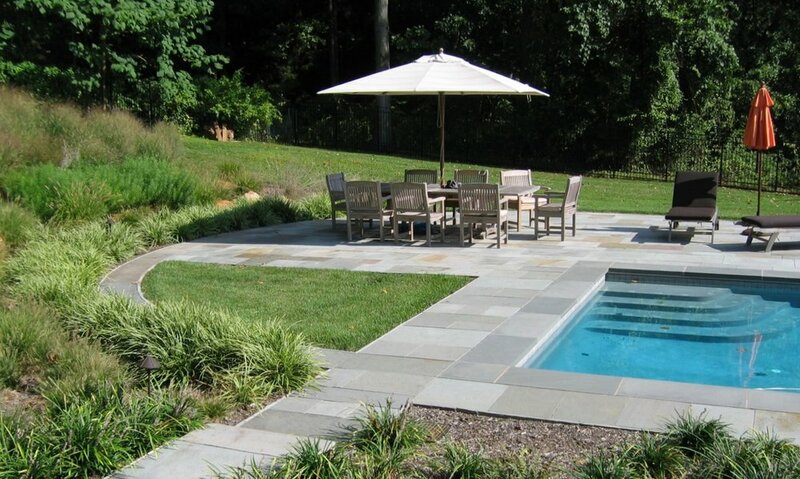 The landscape design for this residence includes a lap pool, hot tub or spa, and a patio for dining and lounging. The project team included Toby A. Hoffman Architects, General Contractor Brian T. Smith Builders, Inc, Pool Contractor Sundance Custom Pools, Inc, and Landscape Contractor Dear Garden Associates, Inc. This swimming pool and planting project were undertaken at the same time as an extensive renovation to the residence. The clients wished to construct a pool suitable for training and exercise, so the long and rectangular shape was intended for swimming laps. The spa is immediately adjacent to the pool for warming up, and is plumbed so it can be utilized for year-round use as well. All of the pool equipment is located behind a retaining wall and remains hidden from the pool area living spaces. Plantings were incorporated throughout the pool space to create privacy, respond to the grade changes across the site, and separate different spaces from each other. Large sweeps of perennials and grasses create a lush backdrop for the bluestone terraces. Perennials that bloom during the summer and early fall were selected primarily since that is the timeframe of heaviest use for the pool. General Contractor: Brian T. Smith Builders, Inc.
Landscape Contractors: Dear Garden Associates, Inc.